The Railtown water tank- October 2010. Photo by Jerome. There is no doubt that the Jamestown water tank is an icon almost as familiar as the No. 3. It can be seen on the park’s logo, and visitors from around the world ask for it by name. Car Hosts point it out on each excursion as ‘the water tank from Petticoat Junction’. But is it? Can we separate the facts from the legend? First, let’s consider the context of our tank. 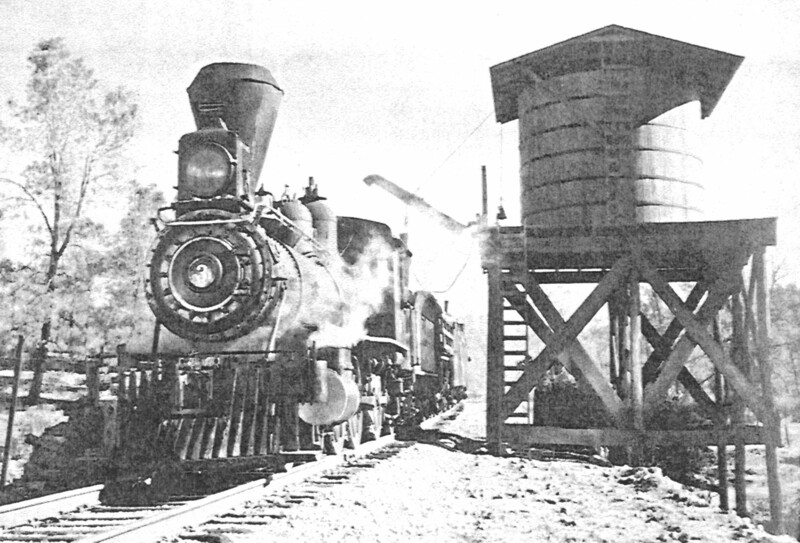 Water tanks were vital to the operation of any steam-powered railroad, and the Sierra Railway was no exception. At various times during its history, water tanks were operational at Cooperstown, Warnerville, Quinn Spur, Standard, Canyon Tank, Paulsell, Jamestown, and Angels Camp. Water columns were available in Oakdale, Tuolumne, and later in Jamestown. The distance between most water tanks throughout the country was 4-12 miles, depending upon the nearby grades and other factors. Functioning water tanks were so important to the operation of the railroad that employees were assigned solely to the task of checking their status on a regular basis, to ensure that water was always available to the locomotives. A tender is attached to the back of each steam locomotive, to hold water and fuel. When the locomotive stops for water, the fireman climbs to the rear of the tender pulls down a water spout, and then pulls on a rope to open the valve, which releases water into the tank of the tender. From there, the water is piped to the boiler where it is heated to create steam to provide the propulsion for the pistons and drive the locomotive. Diesel locomotives do not require water, therefore, the demise of the steam locomotive in America also correlated with the demise of the water tank. While it is difficult to determine exact numbers, today very few water tanks survive, compared to the number in operation a century ago, and fewer still are in regular use. 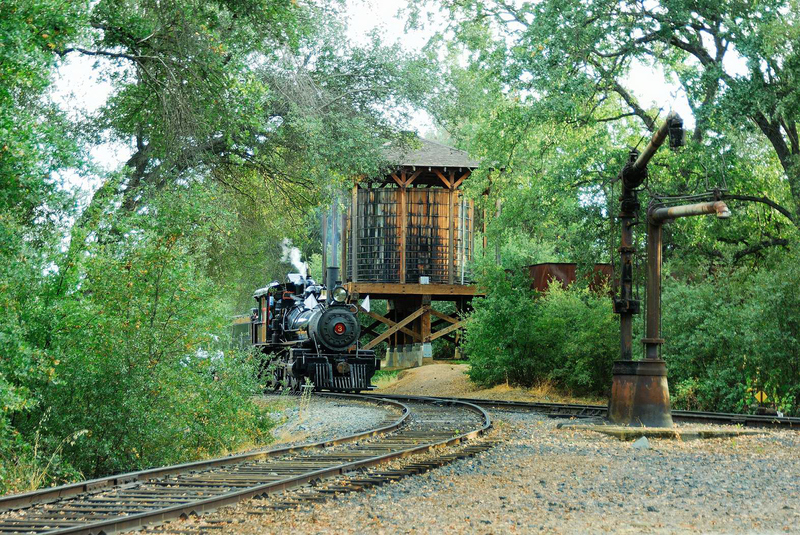 The absence of construction records for the Sierra Railway makes it very difficult to date structures at Railtown 1897 State Historic Park– including the Jamestown water tank. As a result, to determine an accurate history of the tanks over the years, we are dependent upon photographic evidence and the few source documents that survive. From these records and existing structures, it appears that in Jamestown, the Sierra used water tanks (at least three, over time) and a water standpipe. The water standpipe that currently exists, across the tracks from the current water tank, appears to be from the early 1920s. It was returned to service in the 1970s, but subsequently discontinued because the ditch water it delivered contained a good deal of silt and sand, which infiltrated the tank. After the State took over operation in 1982, a smaller, Tulolumne Utilities Distric pipe was installed to supply the tank and the water column. The reduced volume of delivery didn’t impact the operation of the water tank, but the reduced capacity water main on the water column, made it inefficient for filling tenders, and its use was abandoned. The current water tank appears to be adjacent to the site of the original Sierra water tank, which was probably used until installation of the water standpipe. The builders of the present foundation marked the year ‘1938’ in the concrete, which allows us to accurately date the footings. As is common, over the years, many repairs and changes were made to the structure. The concrete footings appear to be the only original elements of the 1938 water tank. Historically, Sierra Railway water tanks built through the early 1930s had roofs over them. This added protection to the tank from weathering, and also reduced the algal growth caused by direct sunlight. Photos taken in Jamestown through the early 1930s show the water tank with a roof. In 1938 the Sierra built a new water tank at Jamestown (date in concrete footings even today) which did not have a roof. This is the water tank that appeared in Petticoat Junction in the 1960s. In the 1970s, the Sierra replaced this tank with an inferior, two-inch thick tank (instead of the standard 3 inch type) and was also significantly smaller and shorter in height in diameter than the earlier tank. At the time of acquisition in 1982, the platform was rebuilt by the State (Department of General Services, Direct Construction Unit), but the 1970s-era water tank was re-used. DCU was not familiar with railroad construction practices, so in building the new platform they modified the design. For “earthquake security” they also created a collar at the base of the support posts – which captured water and led to rot. In addition, the tank was not sufficiently supported on the platform, resulting in failure as the wood rotted. These issues necessitated replacement of the tank and platform in 2001. Since interpretively most of the Railtown facility represents a period through the 1920s-30s, and because a roof on the water tank will make it last longer, the decision in 2001 was to rebuild the tank to represent the appearance of the earlier known Jamestown water tank. The numerous changes over the years made adherence to the Secretary of the Interior’s Standards for Historic Preservation a challenge, although photographs of water tanks along the Sierra were consulted as part of the design process. So, what is the main message for our visitors? 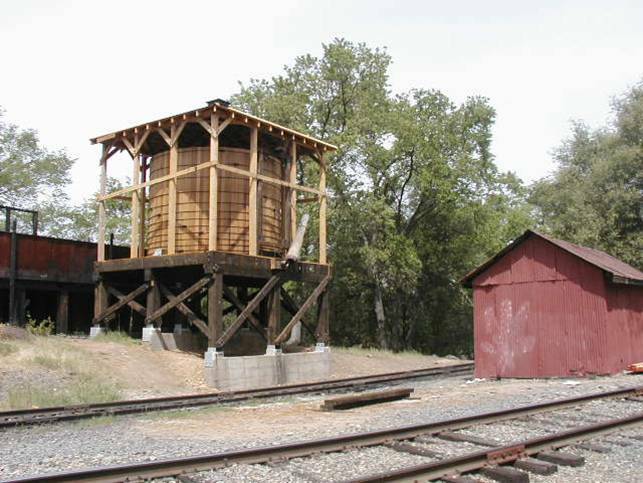 Over the years, the Sierra built at least three water tanks, as well as a water standpipe, at the Jamestown site to provide water for steam locomotives. The current water tank is a reconstruction, based on photographic evidence and is similar to the earliest known water tank on the site. The only original elements of the 1938 water tank (the one appearing in Petticoat Junction) are the three concrete footings, the spout and other hardware. On operating days, the water tank is used at least twice a day to water the locomotive, providing a unique opportunity for visitors to observe an activity that was once common throughout the country. In interpreting the history of the water tank to passengers, it would be most accurate to describe the tank as a reconstruction, in the same location of the Petticoat Junction tank, but emphasize how the watering process ties in to our overall theme of perpetuating the lost art of steam railroading. 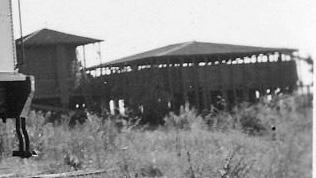 2001 – now water tank and platform constructed on 1938 footings – design follows style of early (pre-1938) tanks and platforms, including roof. Taken in the early 1920s, this image from the ICC valuation, shows the Sierra No. 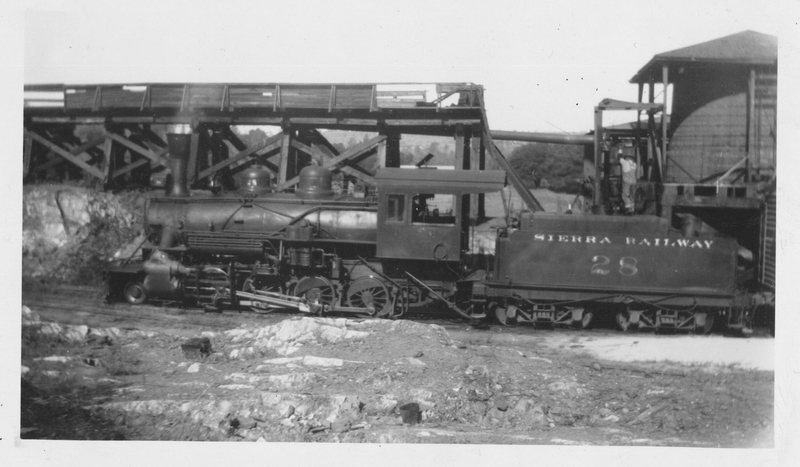 28 with the water tank and trestle. Notice the hip roof, and graduated sides of the water tank. The oil trestle was used to bring a tank car to the oil bunker, so the oil could drain by gravity into the large oil tank behind the water tank. The trestle was built about 1912, replacing the track that ran up the hillside on the opposite side oft he mainline, with an overhead pipe to the oil tank. The fireman in this image is filling the oil tank of the locomotive, by use of the oil spout. This detail of a larger image, taken in 1933, shows the hip roofs on the water tank and oil bunker. 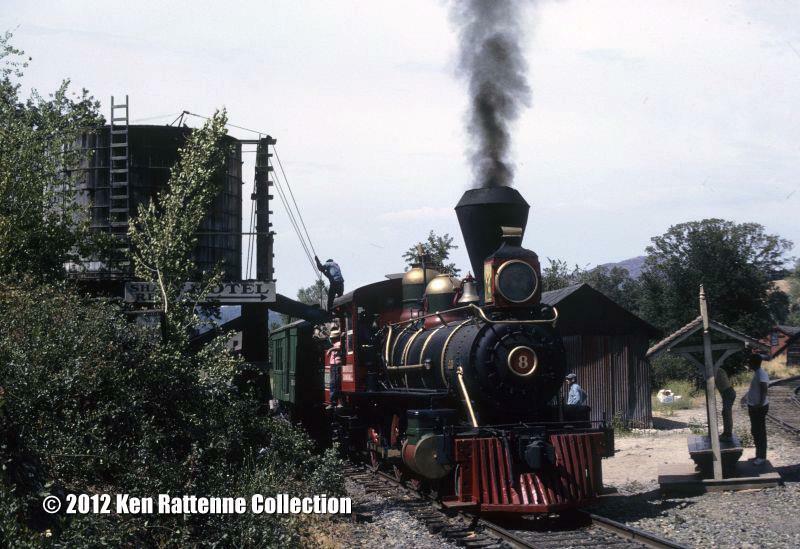 In this Jim Wren photo, taken in 1965 during the filming of Petticoat Junction, the uncovered water tank can be seen. Image courtesy of Ken Rattene. 1971 image of the water tank in action. This 2002 image shows the water tank just after reconstruction. The oil bunker in the rear lost its roof in an early 1970s brush fire. 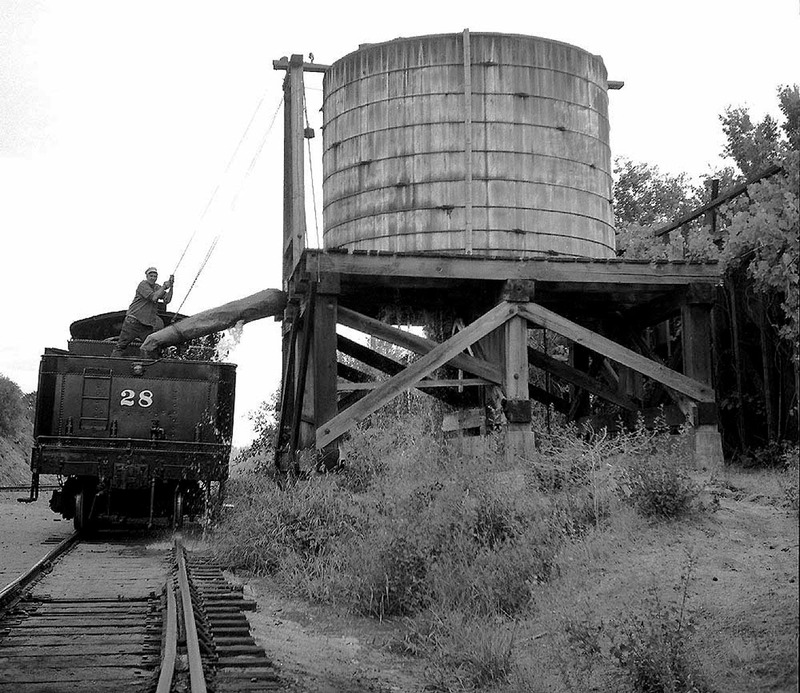 As an interesting side note- this image, of the Quinn Spur water tank (near Chinese Camp), taken in 1953 during the filming of Man of the West, was the inspiration for the Railtown 1897 State Historic Park logo. If you have any of your own images, comments, or questions to share, please visit us on facebook. This entry was posted in History, Restoration and tagged Jamestown, Quinn Spur, Railtown, Sierra No. 3, Sierra Railway Water Tank, Water Tank. Bookmark the permalink.